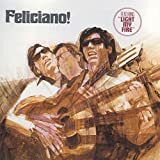 These are lyrics by Jose Feliciano that we think are kind of repetitive. What's up with this? The monotony is only broken by the profound lines 'Prospero ano de felicidad' and 'from the bottom of my heart' - spare me, Jose, just send cash.